Puny power tool manufacturer, don't make Hulk angry. You wouldn't like him when he's angry. THR, Esq., the Hollywood Reporter's entertainment law blog, reports that Marvel has sued a manufacturer that is using the name Hulk as a brand name for air compressors. 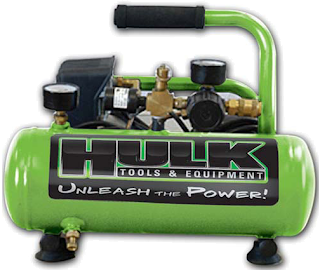 Airbase Industries applied last year to register HULK as its own trademark for power and hand tools (USPTO serial number 77757650); Marvel has opposed that application. Marvel has now filed suit against Airbase in federal court, alleging trademark infringement and various other claims.